Before the hit exhibit Hip-Hop: A Cultural Odyssey ends on May 4, join us in the Clive Davis Theater for a special screening of Bouncing Cats. One of the featured documentary films of the second season of The LA New Wave Intl' Film Festival, Bouncing Cats is the inspiring story of one man's attempt to create a better life for the children of Uganda using the unlikely tool of hip-hop with a focus on b-boy culture and breakdance. In 2006, Abraham "Abramz" Tekya, a Ugandan b-boy and A.I.D.S. orphan created Breakdance Project Uganda (B.P.U.). The dream was to establish a free workshop that would empower, rehabilitate, and heal the community by teaching youth about b-boy culture. Crazy Legs, one of the founding members of the world famous Rock Steady Crew, visited Uganda after receiving an invitation from Abramz to teach b-boy classes. What he discovered upon his arrival was both heartbreaking and inspiring. 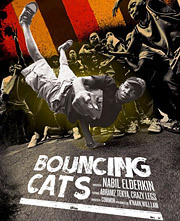 Bouncing Cats follows Abramz, Crazy Legs, and Breakdance Project Uganda on a journey to use hip-hop culture for positive social change. The film features narration by Common and interviews with Mos Def, Will.I.Am, and K'Naan.